At our Calgary law firm, we understand that writing a will can be an emotional experience, however we are here to help ensure that your will is prepared correctly. Our wills and estates lawyers will discuss your individual situation with you, point out any potential issues and help you find a customized solution that meets your needs. 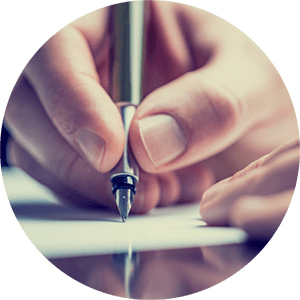 Our professional approach to providing wills and estates law services ensures that you receive personalized service and all of your concerns and questions are addressed. As your personal circumstances change, it is also a simple process for you to update your documents. A Will is a legal document that provides instructions on how your estate is to distributed after your death. It allows you to appoint an executor or personal representative or a trustee who is authorized take on the role of ensuring that your debts are paid and that your estate is distributed according to your final wishes. A Will can also designate guardians for minor children and specify how your dependents can be taken care of in the event of your death. A power of attorney is a legal document that allows you to name a person (attorney) to make financial decisions (not personal) on your behalf. Depending on your situation, you can have the power of attorney effective immediately upon signing, or alternatively, upon the occurrence of an event (i.e. losing mental capacity). A personal directive is a legal document that allows you to name a person (agent) to make personal decisions (not financial) on your behalf in the event that you lose mental capacity. It will specify the areas in which your agent will have decision-making authority, such as where you live, who looks after your children, health care and what activities you will partake in.